She broke my heart, So I broke her jaw. Not really helpful or worthwhile but he’s about 183cm, not 187. I know for a fact he’s shorter than Welbeck who is about 185/6. I’m hoping he shows some progression this season, but I have a bad feeling that he’ll be struggling and that this coming season will be seen as a step backwards in terms of his development. That said, he seems to have a good head on him, so I’m hoping that he’s got the strength and character to turn it around even if this season becomes a struggle. Will be fine post Jose - the fact he is a left winger now after breaking through as a poacher type striker shows how badly he has been effected. 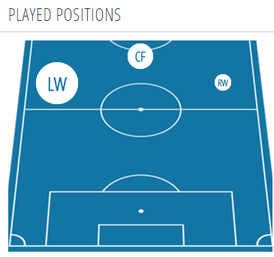 I can’t find a good welbeck example but here’s one with Henderson who is listed at 187. He's hardly going to be standing straight with Phil Jones on his back. This a better look? I’m not trying to argue about this but Rashford is not nigh on 6’2” tall. He’s taller than TAA who is listed at 180 but shorter than Henderson listed at 187. Can't take pic from that site. Click next and there is pic of Rashford beside Welbeck. I've not seen anything from his appearances at the world cup that suggests his slump in form is over. He has looked very slow and off the pace today. In on the first page to say that I don't think he's good enough, I've never thought that he's good enough. I also hate seeing him as our set piece taker. I'd love nothing more, in footballing terms, than for him to make me look a fool this season. I'll gladly eat humble pie in 11 months if he's shown any improvement on 2016 which remains his best spell in our shirt. I thought he did well today and was a major reason for England having a good spell. 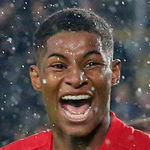 Full of energy and was happy to take players on, let's not write off a very talented 20 year old, Manchester United has always given these players time and with time Rashford will be very good. I'd like to see how he could adapt to our right wing this season, there's a lot of game time to be had if he can play well there. I don’t know. From what I see, he isn’t good enough at the moment, but as has long been said, with young players you need patience and all that, so maybe he’ll be amazing. Am not worried about Rashford. He is sporadic now but when he finally clicks, he is going to be deadly. Only a matter of when not if. Him and Jones are coming back early from their holidays to help out the team in a difficult moment. Both deserve massive credit for that. Hopefully people remember this. Good on em, can see Jones been stuck out at RB, if Martial is off then Rashford is vital early on. Great news, Rashford should be a real boost to our attack especially. I was just thinking about Rashford an hour ago. Was thinking that with our current options, he’s our best bet to stick with as a RW. I’d give him a few games there if nobody is signed and see how he steps up. If we're not signing a right winger then at this point there's no harm in at least trying him there. To be honest if I were him I'd be pushing for that role because the other two attacking positions are locked down, no one's taking Sanchez and Lukaku out of the team. If he has a few matches to get used to the role then who knows, maybe he could end up being decent there. Very well done for coming back early off his holidays, he didn't start every game at the WC but he certainly featured a good amount. I'm expecting a much better season this year, he'll be 21 in October and that's really the age he should begin to iron out some of the inconsistencies in his game. If we do sign Maguire then I see 3-5-2 rather than the need of a rw but that depends on if Delot can step up as quickly as we're reportedly expecting him to. I am probably one his biggest fans here, but I think it's time someone(Mourinho or Rashford) comes out and say what's the situation with Rashford and aerial duels. I am pretty sure there's more into it than him being young and weak(even though he is far from the weakest players you'll see). He is literally avoiding any jumping and going into aerials duels whatsoever, there must be some physical/pshysical problem with him regarding this, maybe his head, back or something like that. He should surely at least try to intimidate opposition players during aearials, and not just ignore every aerial duel during the game and stay away whenever someone is challenging him in 50/50 situations. It's really annoying stuff. Discussed this topic a bit like past 2 seasons. Rashford was very small not long before he made senior debut. Seems like he's still not accustomed to making use of his physical growth. On big picture, it seems this is something to do with our academy. Pogba,TFM,Welbeck look underwhelming for their sizes & physical attributes if they are to head the ball. Then Evans, McTominay who are tall, but lacks physical presence while they're getting involved more as their responsibilities require. Ran about a lot, looks fit at least. Just to be clear; i am talking now about rashford on no9 position. One of the worst striker displays that i have ever seen from our striker. This was just awful awful awful. Like amateur player who is thrown to play with professionals. His movement was always wrong. Decisions with the ball shambolic( that chance when flag was up. What the hell was that?). And the most important thing because it is our way of play; he didn't jump for any high ball. He didn't even try. He is not striker. Period. He is lucky that he is our academy player. It is only reason why he plays in front of martial on that no9 position. Needs to stop complicating things, one on ones he shouldn’t be taking so many touches. Doesn't have any presence as a striker. Made some good runs throughout the match but he was still disappointing with his decision making. Would prefer to see Martial on the right instead of Rashford tbh. But that's not to say Rashford is bad, just Martial has more talent. Will be difficult for Rashford to get a look in when Lingard is fit, although he may well have his uses for certain matches. Can't play as a target-man. Mou relies on his CF being capable of holding the ball up under physical pressure and allowing the support to to arrive. Not Rashford's game. Was poor, he doesn't look a threat. I think Rashford and Sanchez just needs to swap positions. Should only be deployed as a striker in games we're going to be countering in. His best performances for us up front have almost always come against the bigger teams. This is no surprise - against deep defences, where he has no room to run into, he's not going to be effective. He should play on the wing in games other than these. I’ve never doubted someone receiving the #10 shirt, until now. It’s a nice choice, but not the right choice. He’s not good enough just yet. Really poor today. Can't think of anything positive. He is not striker. Period. I reckon he'd be good if we were using a two striker system. Indeed it'd probably be his best position. Unfortunately for him we (and most top teams these days) don't play with two strikers. As a solo striker he's terrible. No presence whatsoever, terrible at winning and holding the ball up, and basically his only trick is to use his speed to get behind the defenders. I really don't understand why we don't swap Rashford and Sanchez. I know it was only preseason but Sanchez looked fantastic playing as the main striker, and Rashford is better on the left than he is up front by himself. He's useless as a striker upfront. Should be kept as a left forward and should stop being greedy. Yeah, he defended well today but I think he's actually closer to being good enough to be our RW in a platoon with Mata than he is to excelling as our backup 9 at the moment. He’s been piss poor since his first season. I honestly feel he’s stealing a living at United and giving him the number 10 is an absolute joke. I’ve been a fan of his since his debut, BUT When you break it all down and look at him, what does he actually offer? I like him, and want him to do well, but he really doesn’t bring alot to the table does he apart from that as a impact sub against a tired high backline. Course, he has moments of class, but only 1 out of every 4/5 games. This is gonna be a very interesting season for him. The manager and fans may start to turn on him if he keeps being so ineffective.